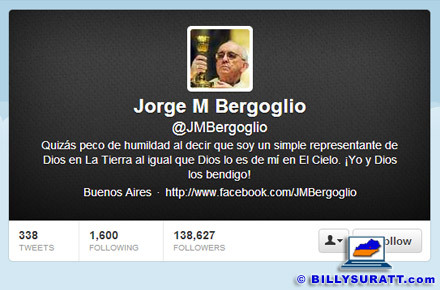 Argentina's Jorge Mario Bergoglio becomes Pope Francis — on Twitter?! You are here: Home » Reality Bytes » Jorge Mario Bergoglio becomes Pope Francis — on Twitter?! Jorge Mario Bergoglio becomes Pope Francis — on Twitter?! Screen capture showing the @JMBergoglio Twitter account, apparently the personal account of Cardinal Jorge Mario Bergoglio, archbishop of Buenos Aires. Bergoglio succeeded Pope Benedict XVI as Pope Francis and it appears the 76-year-old Jesuit announced his own papal election on Twitter. The @JMBergoglio account had 86,199 Twitter followers and was following 1,599 others when I discovered it, approximately 45 minutes after the new pope was announced. Followers are at 128,283 139,767 now and growing by the minute; the account also started following one more person less than an hour after Bergoglio became pontiff. Expect Pope Francis, 76, to be much more active in social media than Benedict XVI was. The newly-elected pope also appears to have a personal Facebook profile with 56 friends. According to the Facebook profile, Bergoglio attended “escuela secundaria industrial,” which translates to “industrial school” in English. It’s hard to know for sure if these two social media accounts actually belong to Bergoglio, but the accounts are linked (as evidenced by the Facebook profile puking out tweets from @JMBergoglio on its Timeline) and contextual clues seem to confirm they do belong to the newly-elected Pope Francis. Pope Benedict XVI, the former Cardinal Joseph Aloisius Ratzinger of Austria, pumped out 39 tweets before his papacy ended on Feb. 28, 2013. Citing declining health, Benedict announced Feb. 11, 2013 he would step down as pope at the end of the month. Benedict has since become known as “pope emeritus.” Church officials chose to remove his tweets from the @Pontifex Twitter account, archiving them all on a Vatican website. UPDATE (3/13/2013 @ 18:09 CT): The @JMBergoglio Twitter account has now been suspended. Knowing how persnickety Twitter can be, though, it doesn’t necessarily mean it didn’t belong to the new pope. The JMBergoglio Facebook profile now has 57 friends. Facebook privacy notice and copyright hoax memes always amaze me. Not the hoaxes themselves so much as some of the people who fall for them. LinkedIn bought Gmail social CRM add-on Rapportive in 2012 and has been systematically destroying it ever since. On July 31, it gets worse.